The firm said the money meant its 2021 launch was now "inevitable". The firm is competing with several rivals, including Elon Musk's SpaceX, which is aiming to build a similar network for global internet coverage. The latest funding round means OneWeb has now raised $3.4bn in total from a host of investors including Japanese technology giant Softbank, Sir Richard Branson's Virgin Group, drinks giant Coca-Cola and chip-maker Qualcomm. 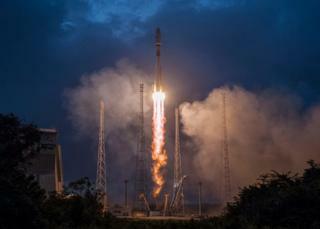 The company said the money would enable it - by the end of the year - to start monthly launches of more than 30 satellites. The firm claims the monthly launches will be "the largest satellite launch campaign in history". "If you look across emerging markets where there is no internet access or very limited access, generally you see poverty.